In 1975 the first annual Arab Health meeting was held in the Middle East and this week the healthcare conference and trade show returned to Dubai, United Arab Emirates. Over the past four days it has brought together over 4,000 companies and more than 130,000 visitors from 163 countries. The major focus for 2016 was on 3D printing, one of the new frontiers in medical technology, where a special zone enabled delegates to participate in interactive demonstrations, hands-on activities and face-to-face conversations. All the major medical imaging companies were represented. GE Healthcare placed a heavy emphasis on digital technology, including big data and the Industrial Internet, and one of the highlights was Invenia, their automated breast ultrasound system (ABUS). Used as an adjunct to digital mammography, ABUS improves sensitivity in dense breast tissue, increasing the likelihood of finding invasive breast cancers by 55%. 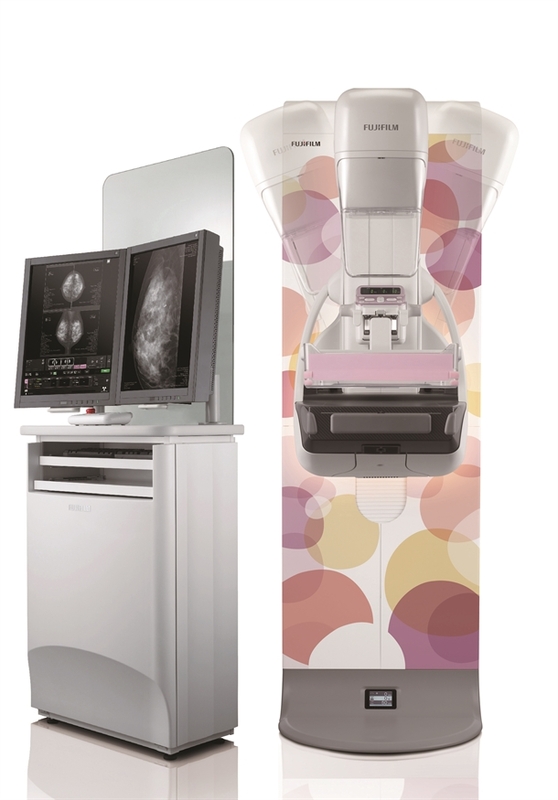 FujiFilm demonstrated their Amulet Innovality device (see below left) that supports digital breast tomosynthesis (DBT), while Siemens and Hologic also exhibited their own DBT systems. Dr Fatina Al Tahan, who is director of the National Breast Screening Programme in Saudi Arabia, presented an important paper, telling her audience: “There is an effective and affordable way to educate our female population and healthcare providers about the importance of early diagnosis, and we need to get the message across to our policymakers that this should be considered as an investment, rather than a cost.” She emphasized the fact that in Saudi Arabia more than 50% of women diagnosed with breast cancer are in their 30s and 40s, and with one of the highest birth rates in the region, there are concerns that breast cancer rates are projected to increase in the future. The screening programme was launched four years ago with the purpose of reducing mortality rates as well as the economic burden of the diseases. Early results have been encouraging, with 198 women diagnosed out of 33,000 screened. Of these, 60% were detected at an early stage and treated, with a 90% survival rate. Al Tahan identified some important lessons: image quality is critical; community intervention increases participation; efficient screening software is a must-have; and research will contribute to better outcomes. She indicated that Saudi Arabia is looking to expand the screening programme from 2016 to 2020 with further investments in infrastructure. Arab Health 2016 has made it clear that the Middle East offers outstanding healthcare, with standards that compare favourably with other parts of the world. In Saudi Arabia more than 50% of women diagnosed with breast cancer are in their 30s and 40s, and with one of the highest birth rates in the region, there are concerns that breast cancer rates are projected to increase in the future. automated breast ultrasound system (ABUS). Used as an adjunct to digital mammography, ABUS improves sensitivity in dense breast tissue, increasing the likelihood of finding invasive breast cancers by 55%. This would be highly cost effective, and could be widely distributed . is so expensive that it precludes many radiology departments from purchasing it. If ABUS is capable of producing much the same results, it would appear to be a WIN, WIN situation, and save significantly more lives than D 2 mammography.